Rebecca Schuman. "A slimy, despicable, trashy, self-indulgent and mentally deranged writer for SLATE magazine." ACHTUNG! 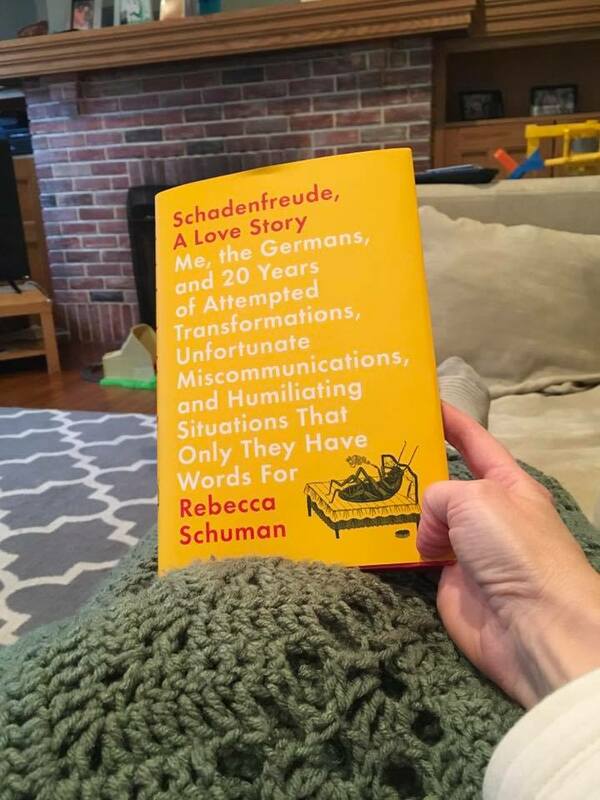 SCHADENFREUDE, A LOVE STORY IS NOW AVAILABLE IN PAPERBACK! You should get it for yourself, all of your friends, and the enemies you actually sorta like, from Barnes & Noble, Amazon, IndieBound, Powell's, Books-A-Million, or iBooks. "Every once in awhile, a coming-of-age memoir arrives that truly breaks the mold — and this one certainly fits that bill." "The good news is the book is enjoyable, amusing, and quickly consumed. The bad news is the book is enjoyable, amusing, and quickly consumed. Just like a big slice of Apfelkuchen, I wanted more." "Her stories of traveling in Europe, taking language classes, and falling in love may be cringe-worthy at times, but they’re also fun." "A FEAST OF HONESTY, HUMILITY AND HUMOR, ALL THE HALLMARKS OF GREAT CONFESSIONAL LITERATURE." 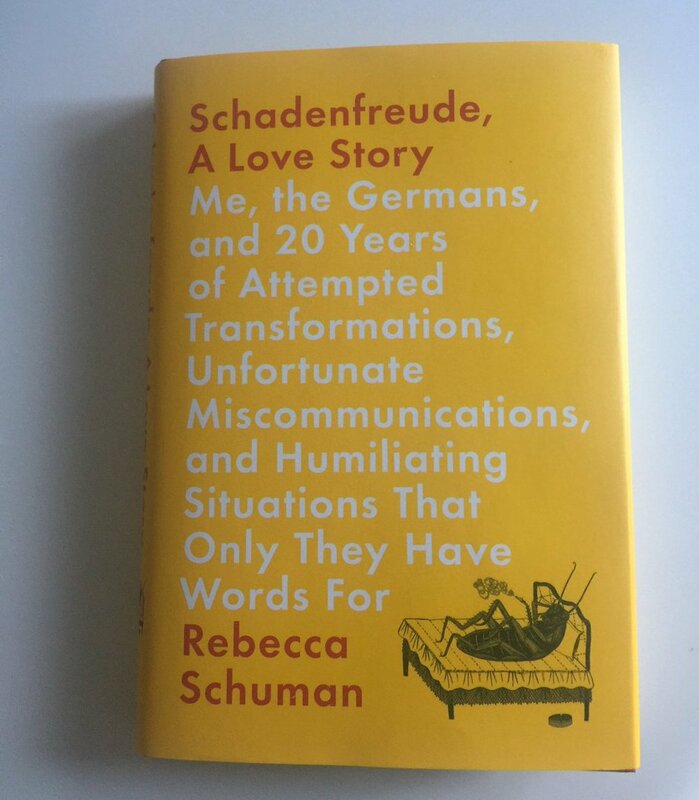 "SCHUMAN ABSOLUTELY REVELS IN THE PAIN CAUSED BY HER LOVE FOR THE GERMAN LANGUAGE." "LIBERALLY SPRINKLED WITH FREE-FLOWING EXPLETIVES." "A fun, wickedly intelligent book about failure, Kafka, and what it means to slowly perfect a language for one's own place in the world. Schuman throws herself headlong into the strange intersections between American grandiosity and German self-effacement with boundless energy, insight, and no shortage of wonderful, cringeworthy moments. What a rewarding, hilarious read." 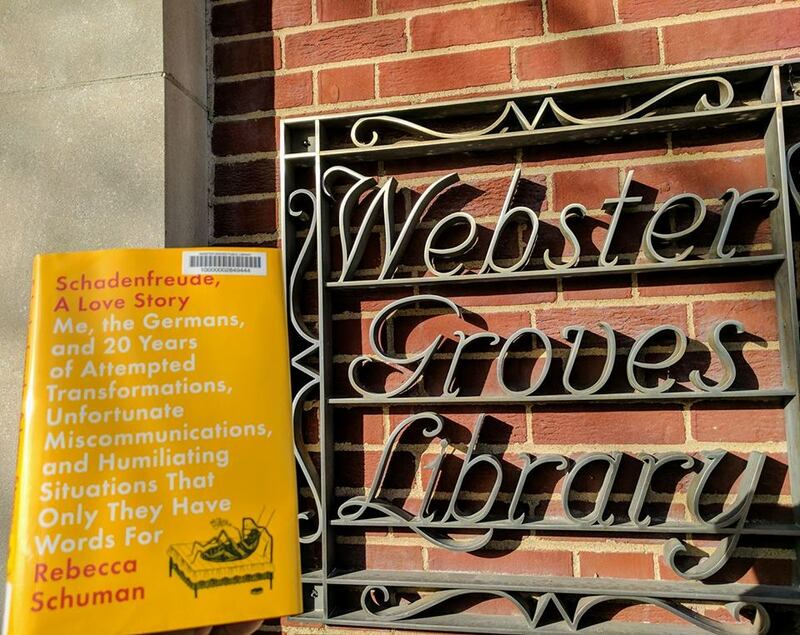 SCHADENFREUDE, A LOVE STORY is the debut memoir by journalist and essayist Rebecca Schuman. Rebecca always wanted a long-term relationship with an interesting guy. She just never figured it would be with someone who'd been dead since 1923. It began in high school, with the discovery a yellowing paperback of Franz Kafka's The Metamorphosis, and a brooding dark-eyed boy who loved The Trial, smelled like Earl Grey tea and broke her heart. The boy was gone, but Kafka was there for good, and this led Rebecca to a strange life of chasing phantoms down twisting cobbled alleys—or, at any rate, of increasingly convoluted attempts to ingratiate herself into the cultures of German-speaking Europe (cultures, of course, with a natural distrust of ingratiation). In college, her ill-thought-out decision to major in German without knowing any German resulted in a failed experiment in Holocaust reparations with a baffled host family, and then some misplaced nostalgia for the Berlin Wall that neither a kitchen-shower nor a racist granny could deter. Her underwhelming entrance to the professional world involved unanswered faxes to Leni Riefenstahl, and a prophetic conversation with a teenage movie star in Prague, who somehow convinced her to go for a PhD. But in grad school, her primary takeaways were sun damage and a weird aversion to eating meals with other people. SCHADENFREUDE, A LOVE STORY is an improbable journey to functional adulthood, with only Franz Kafka as the consistent arbiter of excellent decisions. Available NOW from FLATIRON BOOKS, at fine book retailers everywhere, and online at Amazon, Barnes & Noble, Books-A-Million, IndieBound, Powell's, & iTunes. For more information, a review copy, a media inquiry, or to book a reading, email Steven Boriack here. Rebecca Schuman was born in Deep Springs, California and grew up in Eugene, Oregon. She graduated from Vassar College, and spent several years working in media and publishing in New York City before beginning her PhD in German at the University of California-Irvine, which she received in 2010. She taught at the University of Missouri-St. Louis and Ohio State before leaving academia in 2013 to become a freelance writer. She writes the "Deutschland Über Us" column for THE AWL, and is a contributor to SLATE, QUARTZ, LITERARY HUB, the CHRONICLE OF HIGHER EDUCATION, the ATLANTIC and other publications. She is also the author of several scholarly articles and KAFKA AND WITTGENSTEIN, an academic book based on her doctoral dissertation. SCHADENFREUDE is her first work of commercial nonfiction. Rebecca lives in St. Louis with her husband and young daughter. "I Think, Therefore I Am Getting the Goddamned Epidural"
Pretty sure this is what people mean by 'parenting philosophy'. Oh look, it's a half-chapter of Schadenfreude, for free!!! "I Made a Mistake In My Book and the Internet Went Nuts"
Well, someone did at any rate. "The Secret to Germany's happiness and success: its values are the opposite of Silicon Valley's"
Well, maybe not Christian Lindner. "2017 was our year of Schadenfreude"
Want to get a literature PhD? You shouldn't. "The Ghosts of Kafka Present"
A meandering review of the sublime new translation of The Metamorphosis. Dog with shark? Egal. Bring (and do) anything you want on the Berlin U-Bahn. A philosophical investigation into why Rebecca probably should have sleep-trained her kid. "I Am Terrified of Taking My Child Literally Anywhere." "College Students Are Not Customers"
Even if what they're "buying" costs eight squillion dollars. "Quit Picking on Old Professors"
Why yes Rebecca does mean her mom, why do you ask? Please refer to p. 403, which contains a 200-page FAQ about this course. "Angela Merkel Has Been Wearing the Same Amazing Tunic for 18 Years"
In Germany, it's old enough to drive. "Trader Joe Has a Brother"
Oh look, it's the most popular thing Rebecca has ever written, and it took her 23 minutes. Weekly column on all things relevant in the last bastion of liberal democracy on Earth. "No Victor Believes in Chance"
What is this 'supply and demand' of which you speak? "The Academic Book as Expensive, Nihilistic Hobby"
Bonus one-way text message tantrum. "The Complete Opposite of Tuna on Toast"
When you leave academia, do a George Costanza. Don't be like these advisors. Especially if you don't advise any dissertations. Oh hey, remember German departments? Your university probably doesn't. "Academe is a Lousy Family Planner"
Having kids will severely cramp your academic style. Don't let that stop you. "Hanging Up on a Calling"
"Why Are Adjuncts Only Fit for the Glue Factory? "Some More of my Personal Failings, To Prove the Meritocracy Exists"
Rebecca likes to perform her own opposition research. "Not Everyone is Suited to Academia"
Yeah, maybe quit saying that, because it's cruel. "True Academia Story of Thesis Hatement (Part I of ??)" The behind-the-scenes you never asked for. For inquiries about Schadenfreude, email ace book publicist Steven Boriack here. Subscribe to the Nihilism for Optimists newsletter for updates on readings and media appearances, releases of new projects, adjudications of unimportant debates, pedantic nebbishy observations, heartfelt rants when blood sugar is low, and the occasional unsolicited kid pic.